Cynthiana Grapes produce a rich, full-bodied red wine with a dry character similar in style to Cabernet Sauvignon but with more spice. and fruit. 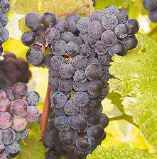 Vigorous plants bear small, flavorful grapes. Drink in the beauty of an Oklahoma vineyard in Spring and celebrate the beginning of a new season with our winery family and friends. You might even take home a few wine grape vines to plant your own vineyard!